If you read Rick Riordan’s Sea of Monsters, you know about Percy Jackson and the rules of the universe that determine how the characters must act. The rules are like our own laws of physics–hard to break them without causing some kind of catastrophe. Note: Rick Riordan is one of our favorite authors (not just because he’s a Texan), and his Percy Jackson books are some of our favorites. You should check out his website (link above), because it’s filled with fantabulousness. Mockingbird and I used to read the books out loud together every night (something we don’t do so much any more–I need to fix that). They are comfy books that get read and re-read just because. The Hoover Dam scene is priceless. So, when it was announced that the first Percy Jackson book, The Lightning Thief, was going to be a movie, there was much squeeing and excitement around here. For about five minutes. Mockingbird and her friends, all still in elementary school at the time, were all abuzz about the casting choices and how NONE of them looked like the character descriptions. 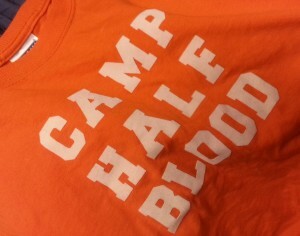 The shirt we made so Mockingbird could be Annabeth for Halloween before the official shirts were sold in stores. Annabeth wasn’t blonde, even though it’s her heritage as Athena’s daughter. No Clarisse (Percy’s nemesis in Camp Half-Blood). Annabeth was more like Clarisse than Annabeth. It was a movie about a parallel universe where the characters were older and not all the same rules of the universe applied. The rules were broken beyond recognition for adaptation to the silver screen. Even with the understanding that a movie must compress the story, the book fans I knew were heartbroken. These young readers adore the books and have read them so many times that Percy, Annabeth, and Grover are people they want to be friends with. They imagine being demigods and think about who their godly parent would be. Having read the books multiple times, they know the Percy Jackson universe. They know the rules, the laws, the mythology, the parentage of the characters, the map of Camp Half-Blood. Fast forward a few years to the Sea of Monsters movie. There is a population of readers who will not go watch or buy the DVDs (my nieces and nephew and a friend’s son, in my very non-scientific survey), and other readers who did go see the movie out of a yearning hope that this one is better than the first one (lots of my friends and their kids belong in this category). None of my friends who have seen it gave it a rave review. Yes, it was better than the first but still disappointing. Don’t get me wrong. I love parallel universes. The parallel world can look a lot like the original (whichever one that is), but with different rules. Remember the TV show Sliders? The first time Quinn slid in the wormhole, he found himself in oppositeland San Francisco. Green lights meant stop, not go. Different parallel universe, different rules, infinite possibilities. The Percy Jackson movies–different universe and different rules–appeal to many people who didn’t read the books. That’s totally OK. That’s a different audience. They may read the books later and not like them because they are too different from the movies. Maybe that’s why I still haven’t read Hunger Games. Fear of rule breaking. For the readers I know, they want the book series’ rules of the universe that are already established and beloved in their heads. Therefore, they can’t even enjoy the movie’s special effects, according to my nephew and nieces. 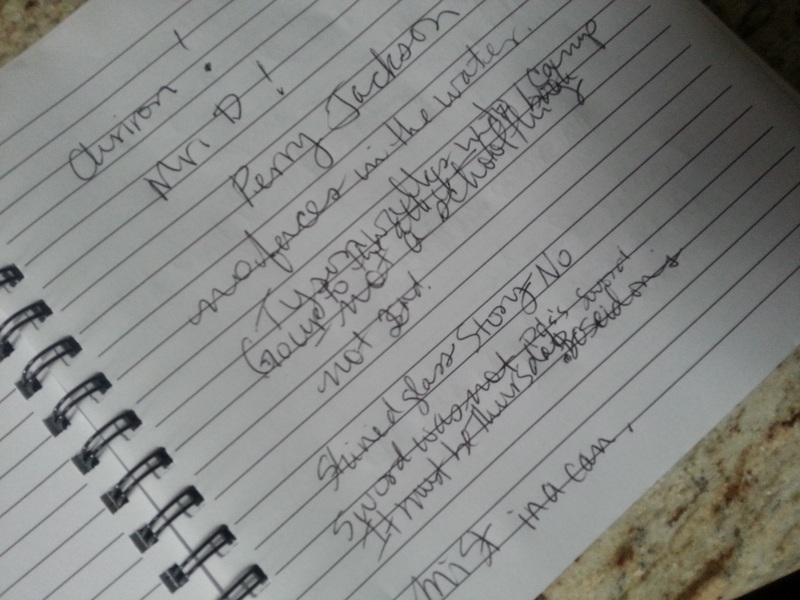 Don’t judge me by my handwriting. It was dark. The adult roles were great, and their parts were too small. Even the teenagers agreed thanks to shows like Buffy, Merlin, Dr. Who, Hunger Games, Dr. Horrible’s Sing-along Blog, Firefly, and others. These girls are well trained. The nectar of the gods is for healing halfbloods. Take too much and they might spontaneously combust. It is not a casual or celebratory drink, because it’s dangerous. Percy’s sword, Riptide, belonged to a different hero in a different time. It was never Poseidon’s sword, nor did Poseidon use it against his father when Kronos tried to eat him. Mist is what the regular humans see so their minds aren’t blown by the real mythology all around them. It doesn’t come in a spray can. The movie got it right with the barista in the coffee shop, but it was an epic fail with Tyson. Sadly, Sea of Monsters is another disappointment that won’t make it into our DVD collection. The books, however, will be read and read again until the hardback covers fall off. Have you ever been disappointed by a movie adaptation of a beloved book? Have you ever read a book after watching the movie version?